In a city with soaring and famously inaccurate water bills, no one should lose their home at tax sale because of an overdue water bill, especially when so many residents are struggling to make ends meet on low incomes. That’s the thinking behind a bill introduced by Del. Mary Washington that prohibits such sales – a measure that was supported by a coalition of faith and justice groups and that was passed unanimously by the full House of Delegates last month. Despite its wide support, however, HB1409 is languishing in the Senate where the chairman of the Budget and Taxation Committee is reportedly refusing to move it until he receives a letter of support from the city senators. 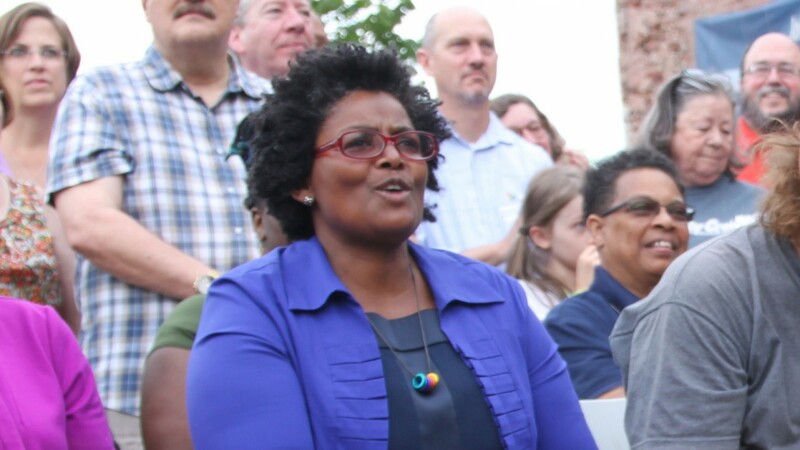 And the letter of support isn’t happening, Washington says, because Sen. Joan Carter Conway – her opponent in the June 26 primary and the chair of city Senate delegation – doesn’t want it to pass and is not bringing it up for a vote. See update below on last-minute changes to SB1098 and reply by Conway. Conway, who represents northeast Baltimore’s 43rd District, as does Washington, has not returned a call from The Brew. Replying after publication, Conway said she informed Washington in a letter yesterday that she “would seek the opinion of the Senate city delegation” on her bill. The letter also informs Washington that the delegation unanimously approved Sen. Barbara Robinson’s water lien bill, SB1098. Neither so far has Sen. Edward J. Kasemeyer, chair of Budget and Taxation committee. With less than a week until the end of the session, advocates have been lobbying Conway, calling on her to bring the bill before the city senators, where they say it has support. “The onus is on those key senators to rise above the politics,” said Rianna Eckel, Maryland organizer for Food and Water Watch, part of the coalition pushing for relief for water customers. “This is something people have worked really hard for that we need now,” she said. Washington complained that she has five other bills currently stalled in the Senate, including HB1224 (Ending Youth Homeless Act of 2018), HB668 (Pediatric Stroke Awareness, Training and Resource Materials) and HB616 (Recordation Tax, Collection by SDAT). Washington’s bill comes as water and sewer charges are set to rise another 9.5% in July, the latest of a series of hikes that will have doubled the price of water in the city over the past eight years. 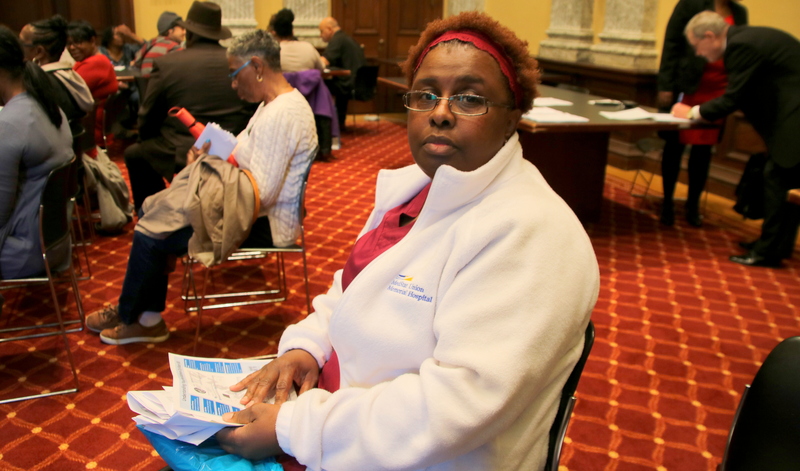 Grassroots activists, backed by studies completed by the Baltimore City Tax Sale Work Group and the Abell Foundation, have been pointing to the harmful effects of these high water rates on poor city residents. Homes can go to tax sale for a $750 unpaid bill that is nine months late. Last year, about 1,000 homeowners faced tax sale at the annual auction for unpaid water bills. 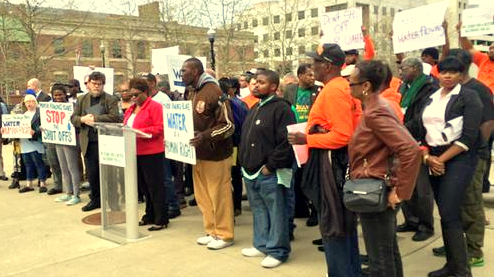 At a 2016 hearing, City Councilman Bill Henry noted that Baltimore’s high water rates exceed United Nations standards. Meanwhile the problem of incorrect water bills persists, with more than 500 customers earlier this year receiving “erroneous, inflated” bills that the city blamed on a software glitch. Election year dynamics in the 43rd are just one factor halting the progress of Washington’s bill. She and others cite the role of Mayor Catherine Pugh, who has reportedly voiced her “back channel” opposition as well. “We keep hearing from Conway, when she’s pressed, that the mayor doesn’t want this bill,” said Molly Amster, of Jews United for Justice. Pugh’s office did not respond when asked if Pugh lobbied against HB1409 or SB1098, a bill introduced by Senator Barbara Robinson with similar provisions that also limits tax sales for unpaid water bills. Spokesman James Bentley instead pointed to Pugh’s announcement in December of “an exceptional and bold policy decision” that halted 2018 tax sales of owner-occupied homes with unpaid water bills. “This moratorium reflects the mayor’s concerns about vulnerable residents receiving inaccurate water bills and she continues to stress and press the Department of Public Works on the importance of a reliable water system,” James Bentley said in an email. Asked about a February 23 meeting of the House delegation at which Karen Stokes, the mayor’s government relations director, spoke in opposition to Washington’s bill, Bentley did not respond. Advocates said at the time that they welcomed Pugh’s moratorium but that more is needed because the change she ordered is a matter of policy, not law, covering just one year and it excludes non-owner-occupied customers – i.e., rental housing. “We’ve been hearing these promises of ‘Oh we’ll fix it next year’ but it never gets fixed,” Washington said, adding that she would be open to including a five-year sunset provision to her bill if necessary. Asked if she would favor Robinson’s bill if it has the same provisions as hers, Washington said yes but pointed out that SB1098 has further to go in the legislative process than hers. “There’s not much time left and mine is ready to go,” she said, noting that she has been working on the issue for three years. Advocates, meanwhile, say they will continue pressing Kasemeyer and Conway. Among them are some of the leaders of the 26 churches added to the tax sale list last year over water bill issues. “Water rates are rising faster than families can keep up, and the Department of Public Works consistently sends falsely inflated water bills,” said the Rev. Keith Bailey, of the Greater Bethesda Missionary Baptist Church on Fulton Avenue. “Rather than meeting our suffering and vulnerable residents with compassion, our city has chosen to give families an impossible choice through tax sale: find money they do not have or lose the roof over their heads,” he said. Washington’s bill has effectively been killed. Last minute changes to that bill, meanwhile, have advocates up in arms today – and refusing to support it. Robinson’s bill had originally covered only owner-occupied homes, mirroring Pugh’s moratorium in its limited scope. When Washington’s bill stalled, the advocates persuaded Robinson to broaden hers to include non-owner-occupied water customers – ie., rental properties. Today, Robinson confirmed that she is considering bringing the bill back to its original owner-occupied-only version ahead of a possible vote tomorrow. If it reverts back to its earlier form, the advocates said, Robinson’s bill will not have their support. “Everyone must be protected from this inhumane practice,” said Rianna Eckel, Maryland organizer for Food and Water Watch.